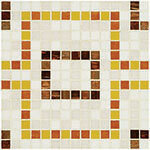 Hakatai offers a beautiful selection of repeating patterns using uncut glass mosaic tile. With a large array of glass tile colors to choose from you can add creativity and mosaic design to kitchen backsplashes, bathroom backsplashes, indoor and outdoor wall surfaces, and poolline borders. Choose from one of our several options of uncut patterns, or create your own pattern. We can create sample sheets so you can see the pattern in your setting and light. Let your imagination be your guide, and let our glass tile designs bring them to life. Each repeating pattern is custom-created according to your color selections and hand-assembled. Ideal for residential as well as commercial applications, glass mosaic repeating patterns bring dimension and modern flair to any space.